We slept well, and were very thankful for it. Today we were going to tackle unfamiliar terrain and unpredictable weather, and it would be in effect our first proper day of trekking. I knew as much of this area as one could without actually visiting it, and I was nervous with anticipation. Our group had been swelled by one more member the previous night. It had been raining hard outside and we had huddled around the hearth gulping down our dinner when there was a knock on the outer door. Jagdish went to investigate and we could hear an American voice say, “Is there any fire? Awesome!” It was a young kid called Devon looking for some warmth and food. 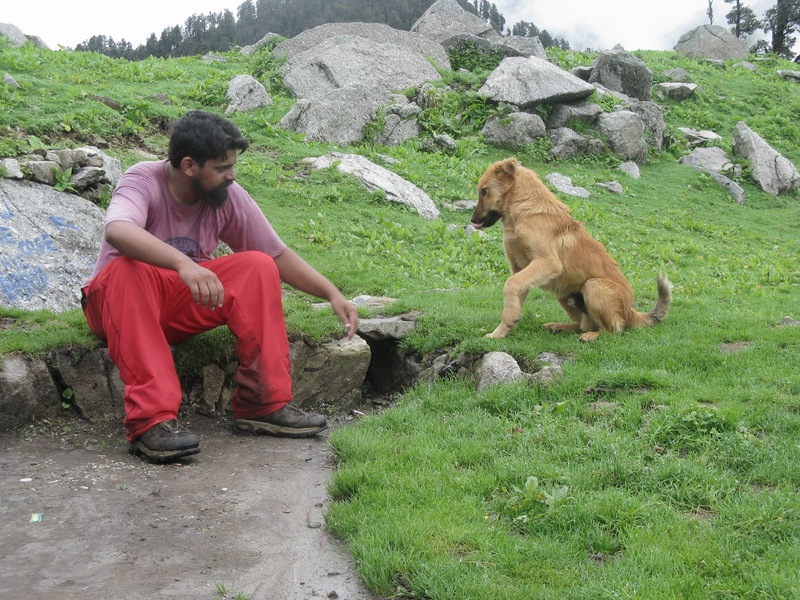 At 9 pm, Triund was effectively shut and as he had heard of us from the tea shops, he’d come to investigate. A typical New Age Californian Golden Boy if there ever was one- all big grins and ‘oh gosh’ amazement- Devon had set off earlier that evening from the upper Bhagsu hippie ghetto for Triund. Armed with an axe, a compact rucksack, lots of biscuits and Maggi noodles, he was looking to spend a few days ‘in the wilderness’ and maybe trek to Indrahar if he could. 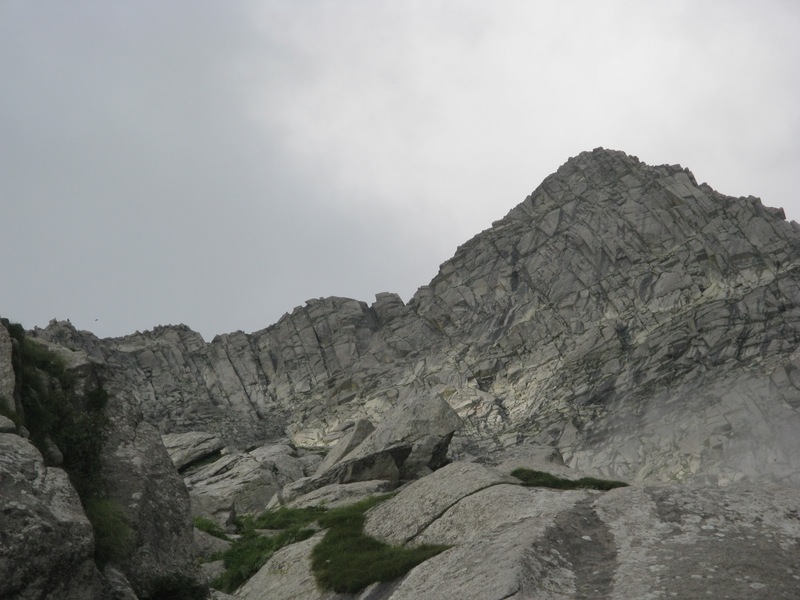 The boy had guts alright, but had severely underestimated his surroundings, and his approach march to Triund late in the day in pouring rain had been a chastising experience. Now he was just happy to have someplace warm and dry to rest. I must admit that I was a bit annoyed with his sudden appearance. I was far too keyed up about the next day to bear his inquisitiveness, and retired to our room. I was hoping that he wouldn’t come with us, but as it is totally against the policy of trekking parties to disallow a willing trier, I left it to Jagdish to take the call. Devon had his way with people, and Jagdish was intrigued enough to allow him to come with us. Anyway, we figured that the hike to Lahesh would make up Devon’s mind for him. But I was adamant that we were not going to pay for his passage and told Jagdish to have a chat with Devon and figure out their terms. But all this was minor. 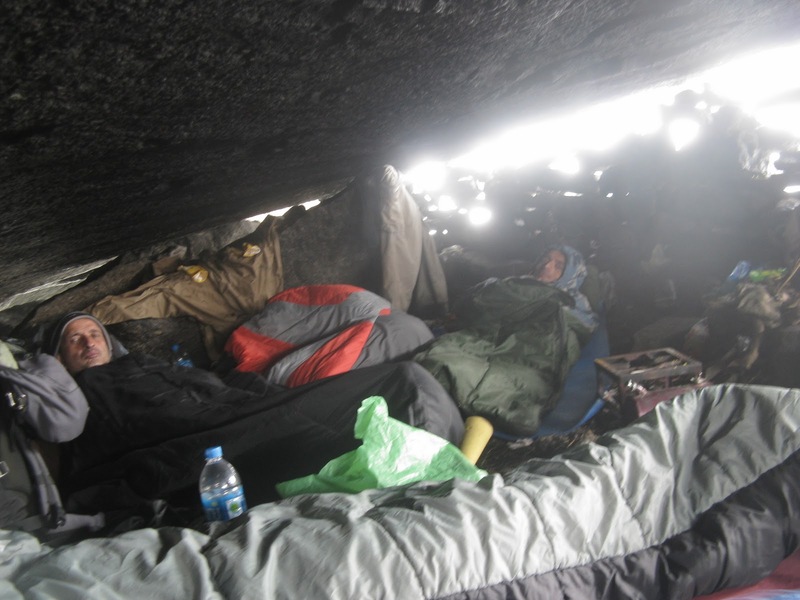 We were all very anxious that morning, packing our sacks in as compact a way as possible and keeping our water-proof stuff as close at hand as possible. Thankfuly it wasn’t raining, and there was no mist, although the sky was heavily overcast. 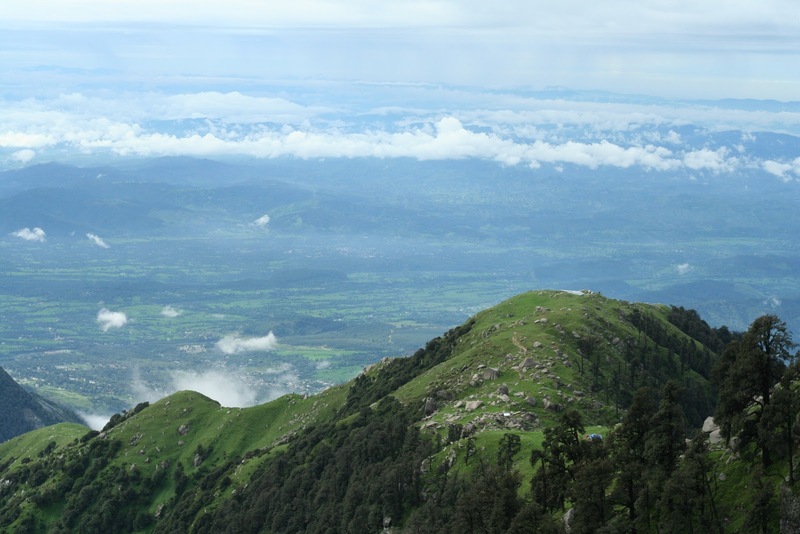 The Kangra valley was largely clear of clouds and in the sharp, rain-washed light of the morning, the valley floor looked beautifully three dimensional, a patchwork of low undulating ridges and green fields and clumps of forests. I made a run to a tea shop, woke up the owner and stocked up on cigarettes and biris. Jagdish, Gulab and KP were hanging about, finishing their tea, while Devon and Oli were busy checking their bags. Presently we were off, and I came last, as is my wont, looking back at the dear little outhouse, which we rapidly left behind. The great shaggy dog followed us for a while, then stopped upon a rock and stared after us. He stayed there a long while, receding into a dot in the distance. It was, in many ways, a touching farewell. We came up past the point we had stopped the earlier day, when Jagdish stopped us and asked us to listen. In the relative silence, we could hear a steady, distant roar. Rock avalanches high up the range. The feeling of stepping into the unknown intensified with every step I took. Most of the track was fairly steep, and I was releaved to see that I was going much better than two days ago. The others were doing well too, and soon after we’d started traversing the Laka ridge, we stopped at a little shrine where Jagdish and Gulab lay a few offerings of flowers and food. As we smoked our biris, Devon was excitedly surveying all. Everything he saw filled him with glee. He loved the biris and the fact that he was actually trekking in the Himalaya pleased him no end. He was of the opinion that if any natural disaster ever befell the world, this would be the place to be. I couldn’t refrain from pointing out to him that we were currently travelling through one of the most seismically active areas of the Hmalaya. The lower ranges of Western Himalaya are rocked by one big earthquake every century. The last one in 1905 was so severe- it had a magnitude of 7.8 on the Richter scale- that much of old Dharamshala was leveled and over 23,000 people and 50,000 animals were killed. The Dhauladhar roughly marked the subduction zone of the lower Himalayan thrust fault, the line along which the Indian sub-continent iss pushing and going under the Eurasian plate with the greatest force. As I told Devon that, he looked a little troubled, then his eyes cleared up again as he grinned and whooped at the thought of what a great adventure he was having. I became a little uneasy myself, and looked around at all the massive boulders arranged in mad jumbles on the slopes all around. The overcast sky which hid the main range added to this faint feeling of menace. We were traversing along the side of the Laka ridge, gaining height gradually. Below us lay the green vales of the Chauran nala and the lower forests, while above us ran another band of rhododendron and pine forests, thick at first, but inevitably straggling towards the tree-line. The weather was fine and the sky clear, and after the last couple of days, this was really heartening. 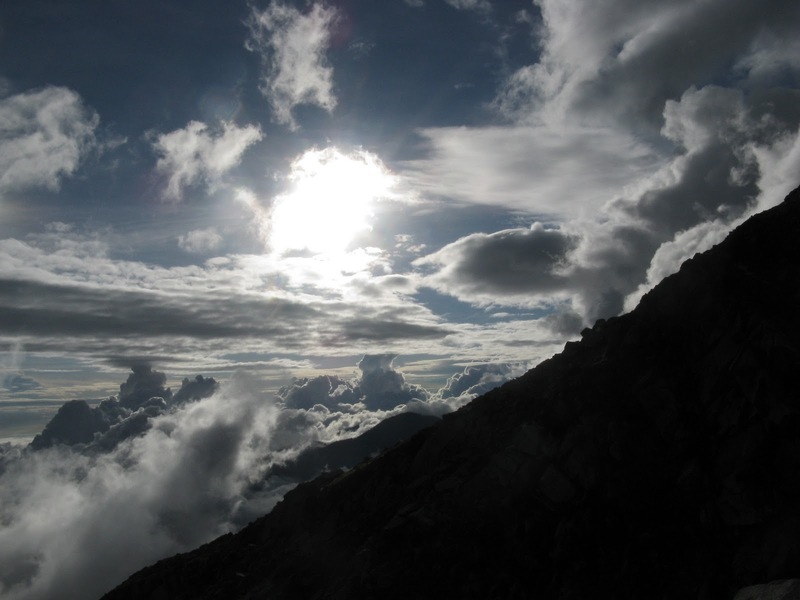 The giant hump of Triund lay below us, and further down lay Kangra stretched out like a beautiful green carpet. The air was alive with birdsong, and we were moving at a steady clip. Slowly the steep ridge started levelling out as we climbed up to the traditional Gaddi pasturage of Laka Got. Green meadows like the one below at Triund, only with more large boulders around as we were almost right up against the rocky face of the Dhauladhar proper. The cool grass of Laka was littered with the copious cattle dung, so I had to keep my eyes peeled to avoid them. Sometimes, of course, you can’t, so you step right into it and hope that the all the water on the trail will wash it away. A final turn of the ridge and we were on the pleasant level stretch of Laka, with a make-shift Gaddi-shelter/ tea-shop called Snow-line Cafe. Appropriately enough, as it turns out, because the Got- a Gaddi word for any clearing where cattle can rest and eat- did roughly mark the tree-line. Before us lay the awesome main wall of the Dhauladhar, all craggy rock-face and massive boulders, the top lost in the grim cloud-blanket. We could even see the various streams barreling down the face. We stopped for tea and rest. While Gulab and Jagdish lit up their biris and Devon bought yet more biscuits, KP gambolled with the resident furry dog of the Got, a sweet, bouncy fellow who was so happy to see more people it was difficult for him to sit still with any one person. Eventually he settled down near KP and looked at him adoringly. Oli and I went off to take pictures. There wasn’t much of a view as a copse of rhododendron hid the views lower down the valley, and that impenetrable blanket hung over the higher reaches. Not for the first time in the trek was I reminded of the Lord of the Rings. That forbidding wall in front could so easily have been the forbidding mountains of Mordor, and the gentlemen sitting in the tea-shop puffing on their ‘pipe-weed’, Hobbits. Ah well, an idle fancy, but I was thrilled to be here. In fact I was looking forward to the next bit of the climb, up to Lahesh Cave. The southern approach to the Dhauladhar is nothing if not abrupt. The change from the alpine meadows at around 3,000 m and the final rise is pretty stark. Soon after we lifted our loads and started trudging towards the thin strip of land that connected the Laka ridge with the main range. The clouds moved in almost as soon as we made off from the tea-shop. Soon we were going up and down steep tracks through impossibly verdant pasture lands dotted with a canopy of white flowers. Occasionally the odd fallen tree barred our way and we had to either crawl under or clamber over them to regain the track. With the deepening mist it also began to get pretty cold. I would’ve ideally liked to have a clearer view of the terrain we were passing through, but the mist did manage to infuse the scene with a lot of atmosphere, as the continuous roar of the nalas grew ever closer and a cold wind began to blow. This is a very important part of the trail up to the pass, a boulder maze where a wrong turn would lead you up a blind alley, and, on an overcast day like today, to worse grief. Soon after, the rain started falling, and the difficulty of a monsoon trek became all too apparent. At that height, rain doesn’t simply fall, it comes at you at an angle. My meagre hood wasn’t doing too well, so I would have to adjust the ear-flap depending on the direction from which the rain was blowing in. Thankfully yesterday’s acclimatisation was bearing fruit, but I was getting very cold, and quite weary. Perhaps sensing my plight, Oli fell back, bringing up the rear. Every now and then she would entice me with thoughts of Hide n Seek biscuits as she insisted that I keep moving. The roaring torrent that we must cross sounded pretty close, and once we were withing sight of it, the cold redoubled, thanks to the chilling spray from the water as it madly galloped downhill. Soon after leaving Laka, the trail had perceptively steepened, and the terrain with it. We were climbing up the face of the Dhauladhar now, and the gradient must have been about 45 degrees, forcing us to use our hands to haul ourselves up. The rucksacks never seemed heavier, and with an almost boring sense of inevitability, we were soaked to the bone. This meant we were chilled to the bone, as well, and the cold spray cut like a knife. Soon I could feel my hands growing numb. 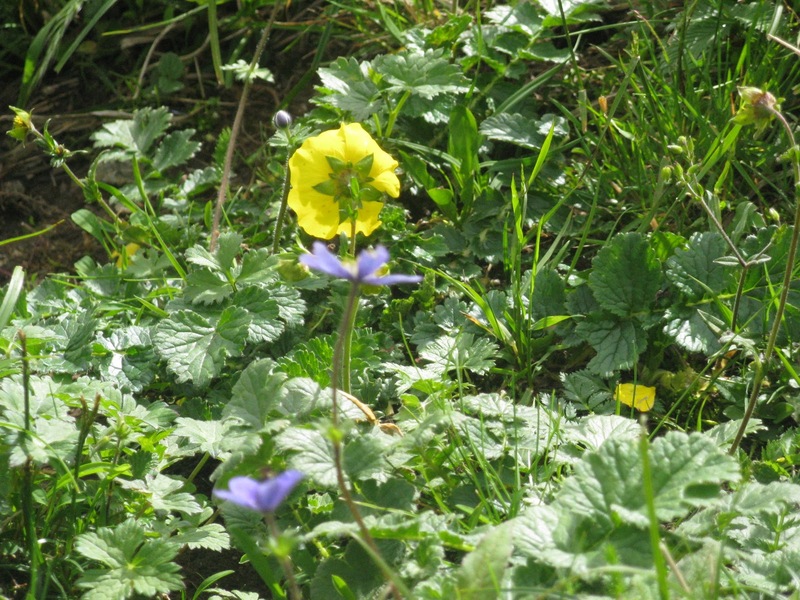 Oli wryly observed that they were growing blue as well, and probably for the only time in the entire trek, I suffered something close to a panic attack. Although I knew that frost bite at this height- and also without any actual frost- was laughable, I was hysterically thinking of finger amputations, or an earthquake, or both. All I could do was to beat my hands on my legs, and keep on trudging. Soon we came to the nala, one of about three that come down from the vicinity of the pass. In other times of the year, these are frozen snow-tongues (which the day trippers fancifully term glaciers), but now they were raging torrents. Trying to cross with the backpack in the blinding, cold spray, I looked towards the helpful face of Jagdish who was standing dramatically poised on two rocks in the middle of the stream. I grabbed his outstretched hands and leaped into the swirling mist, and landed on a little bare patch in the middle of a maze of rocks. Once on the true right of the nala, we began climbing in earnest towards the cave, now apparently somewhere 200 feet above us in the steep rock staircase that we were struggling over. Gulab and KP were up ahead, but were pretty invisible. Every now and then I would squint up and catch a bit of bright fabric far above. I would lower my face, stare at my boots, close my eyes, sigh, and stagger on. Now the gradient seemed to be closer to 60 degrees than 45. I don’t remember how much longer we climbed- it couldn’t have been too long in real time- but it seemed like we were going on forever. To our left the massive, tangled rock-fall that is the Dhauladhar and to our right, steeply falling away for a few hundred feet below us, the torrent- a waterfall in places- leaping down into the mist with heightened ferocity. Following up the channel, through my half-closed eyes I could make out patches of rotten snow clinging to the rock-face. Beyond this pretty inhuman scene, half-guessed in the dark mist, lay a larger, blacker shadow. I figured that this must be one of the massive ribs of rock that form the serrated south face of the Mon. I was proved right later. Drawing some degree of happiness with my relative knowledge of the land, I resumed climbing. And suddenly, we were there. But where was ‘there’? All I could see were the gigantic boulders that dominated this wonderland of thrusting rock, pouring rain and swirling mists. Following directions, we climbed out of the channel and onto the other side of the face we were following. Immediately the wind hit us with renewed vigour, but I could see the cave, 50 feet above me. Imagine a gigantic boulder crashing down from a great height and suddenly stop, poised over some nameless abyss. Then imagine the upper face of that boulder to resemble some sort of an out-thrust lower lip. Now imagine an even bigger boulder wedged atop the first, the two forming something like a highly sexualised mouth open and moaning with ecstasy. 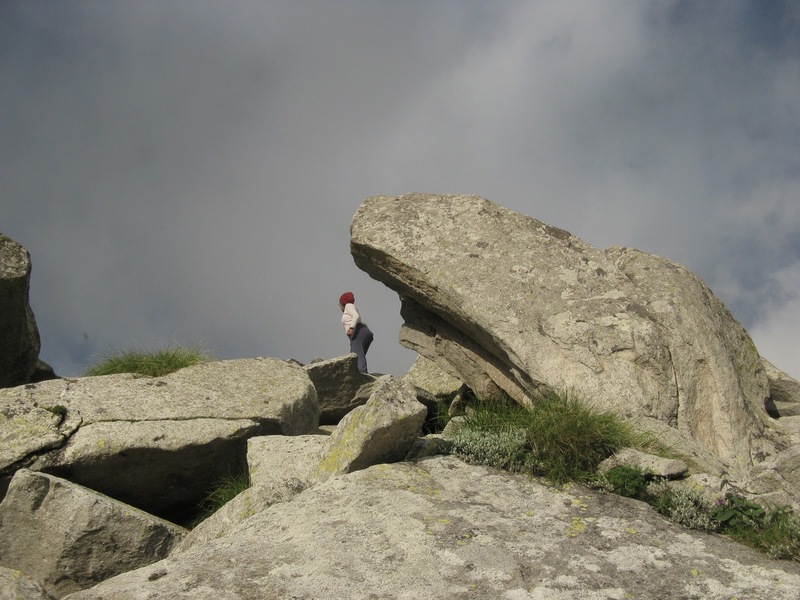 Climbing up the last few stones up onto the mouth, we paused for a second, and plunged down into this giant mouth. Oli describes the cave well. “Imagine a huge, huge, massive rockfall – perhaps when the Dhauladhar shift, or shift their weight from one foot to the other, or something. Anyway, something big enough to drop down boulders the size of small houses. And one of these, with a remarkably even surface, had come to rest on a huge pile of (gradually) compacted rocks. And the other boulder, of about the same size, had come to rest on top of it, with its own wedge giving it an upward slope. The two boulders being sort of like the roof and floor of a mouth, and the mouth open. Lahesh is often called a cave – and it does feel like one, when you are in it. But it is really this massive rockfall. And the Gaddis – the local shepherds and goatherds and the masters of the wind and water of the place, so well do they understand the landscape and the elements in it – had spotted the thing with their impeccable sight, walled up the exposed sides of the ‘cave’ with smaller rocks, and turned it into this marvel of a shelter. When I got to the entrance to the cave myself did I realize the amazing architecture of the thing. In spite of the abundant… er, ventilation at the sides and entrance to the cave, the inside was perfectly dry. What rain did come through to any inside surface was allowed to run back using the natural slope of the ‘roof’ boulder into a little ‘canal’ dug at the back of the cave to give the water free channel to the outside. And though you could not stand upright in the cave at any spot, the entire thing was big enough to shelter possibly up to 25 or even 30 people.” Lahesh is just one among the myriad examples we got of the Gaddi’s resourcefulness. It also gave me a sense of how well the know these mountains. The trouble with cave, though, was that you had to squat at all times, as at its highest, its only about 3.5 to 5 feet. Gulab had already gotten the stove running, and tea was in order. It had mercifully stopped raining, and shivering woefully, I took off my dripping boots and socks, put on some woolen ones- along with wool mitts- and took the wet stuff out to dry. The wind was very strong, so we had to find small rocks to use as weights to keep the wet clothes from blowing away. The ORS solution that Oli had forced down my throat when I’d staggered into the cave had revived me somewhat, and the warmth and hot lunch completed the job. It was pretty early in the afternoon still, but we were all dog-tired and KP was feeling the effects of altitude. So we promptly got into our sleeping bags, maneuvered ourselves along the ground sheets, and with bags and rocks for pillows, drifted off. As usual, Oli was soon kicking me out of bed. It was time for acclimatising, and though KP promptly rolled over, ignored her pleas and went back to sleep, I squatted out of the cave, eager to get out of the cramped cave and stretch my legs a little. Gulab and Jagdish were already up, washing dishes, preparing for dinner and smoking biris. Devon was fast asleep. Oli had claimed that the sun was out, but all I could see was impenetrable grey all around us. My legs were very woozy, and I was feeling a little dizzy. We walked around on the ‘courtyard’ boulder, looking at the hilarious graffiti of trekkers past on the cave walls and trying to get KP out. He did emerge, looking very harassed, and stood around with eyes half shut, as we waited for the sun to appear. It didn’t for a while, so KP made some excuse, and went back in. It was around 4 pm now, and the the thick clouds were clearing a little, blown up and away by the strong wind. Soon a dull, round searchlight made its appearance through the mist and little by little revealed itself to be the sun. Suddenly, the mountain was clear of clouds, and we were basking in the merciful warmth of the late sun. Oli and I decided to climb a little higher to get a better view. Clambering over rocks the size of people at that steepness should never be attempted in socks and hawaii chappals, but that was what I was forced to do in the absence of a dry pair of boots. Oli was wearing her rock climbing boots, so she was extremely well equipped. Now with the clouds reduced to the occasional wispy feather floating up the Dhauladhar, we could get a bearing of our surroundings. We were basically standing inbetween two massive;y steep ridges rising up to the shadowy peaks above. To our North east was the one which led up to the Mon, and there was another one to our right, in the north west. And the boulders! They came in all shapes and sizes, from those as small and round as a football to others as big as cathedral spires. It really did look like this vast theatre of rock. Following the Mon face was our nala. At this height it wasn’t a stream but a tongue of rotted snow with a surface like fish-scales. As we climbed from one rock ledge to another, aiming for a vast cluster of boulders above us, I gaped at the beauty around me. What appeared as sterile, steep rock-faces from Triund, now revealed long swards of the greenest grass, flecked with tiny flowers of various colours. As I made my tortuous progress from ledge to ledge, moving very slowly so as not to lose my slippers, I felt like a little old man pottering about in a dressing gown looking for some tobacco. The huge tufts of clouds floating in the distance really did look like puffs of smoke anyway; it seemed that the Kangra valley, some 10,000 feet below, was steaming. We were in the middle of a cloud garden- gleaming spires and puffy balls of cotton; inhuman faces and sailing ships- they made their stately progression from east to west, flowing along detached from the world of rock and boulders. Occasionally they would bump against a huge outcrop and simply flow over them. Far below me I could see the top of the Laka ridge, and if I looked carefully I could also make out the tiny pin-prick of blue that is the “Snow-Line cafe”. 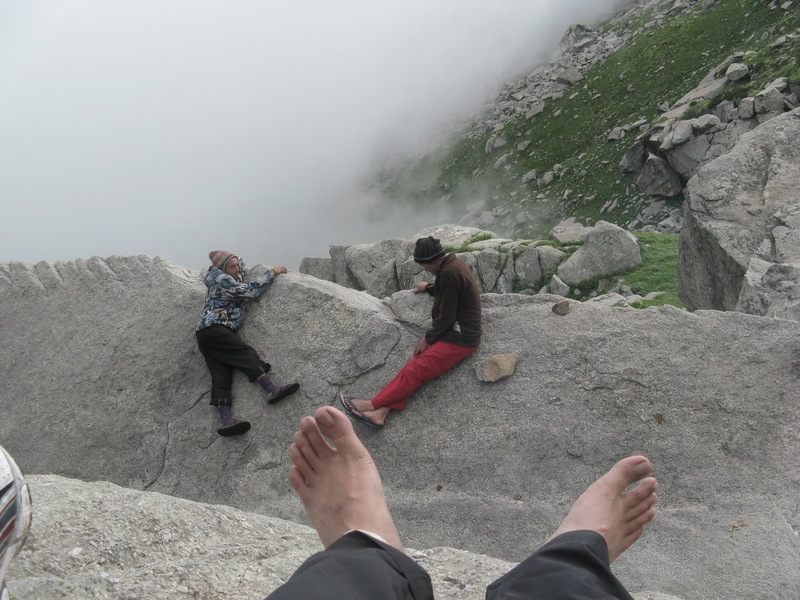 Triund was further below. It obviously felt strange, looking down at the landmarks that I’d been looking up at for the last two years. These ridges would vanish slowly under a fresh cloud, looking like a dense Chinese painting, only to reveal themselves slowly a little later. This dance of presence/absence was absolutely fascinating. To my extreme right, down to the south-west lay the green terrace fields of Kareri, which we hoped to reach a week from now. In a straight line with the cave directly to the south lay the tiny village of Naddi. And then there was the sky. A cloud-garden of overpowering beauty, the swirling mists made a halo around the sun until I wasn’t sure what planet I was on. I’m a sentimental type, and I swear I felt like crying at the beauty of it all. Pic: The sun comes out at the end of the day. Picture by Bibek Bhattacharya. KP had finally emerged with the sun, and now he was a red dot dramatically framed by the immense boulder landscape, contemplating the void, as is his wont. Devon was pottering about in his multi-coloured rags, hopping with a lithe grace from boulder to boulder and occasionally flashing his big smile. On the “courtyard” rock in front of the cave, old hand Jagdish was giving young ‘un Gulab a crash course in the lay of the land. Suddenly they looked up beyond me and started speaking loudly and pointing. I jumped around, thinking of all those black bears I had heard of. What they were pointing at was far more dramatic. The cloud curtain over the pass and Mon peak had finally cleared in the light of the evening sun. There it was, the ridge top, looming over us like a frozen wave with millions of tons of bare rock held upright in space by what seemed like a miracle. Still about 500 m above us, the pass was a tiny depression and the peaks of Cairn and especially Mon two massive behemoths glinting gold in the sun. We’d have a long way to climb tomorrow to the top, and then that would be just half the day’s walk done. I didn’t want to think about it right then. In the late sunlight of the dying day, the world was as peaceful as it could possibly be. Me and KP accompanied Oli to an overhanging cluster of boulders and sat down to ruminate, as she set off for a climb and was soon lost to view. super! Such a nice, long, and detailed description of the trek…you should go on a trek every two months and photograph them and write about them!